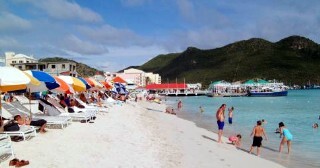 Few islands in the Caribbean exude the quality “personality” of St. Maarten/St. Martin, a 37-square-mile island whose culture is enticingly half Dutch, half French. The Dutch side is a member island of the Netherlands Antilles. It’s also part of the Kingdom of the Netherlands, but not considered European territory. About two thirds of the island is French territory, technically a part of Europe and the European Community. In other words, this “is” France. That said, thanks to the 1648 Concordia Agreement, the two sides get along quite well. You won't find any border formalties as locals and visitors move freely between the two sides. What’s to see and do? 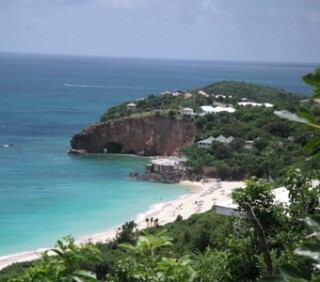 First, there are multiple, high-quality beaches -- Mullet Bay is shown above. * Many are off-the-beaten path and drop-dead gorgeous. Offshore, you might work the sails onboard a 12-meter America's Cup yacht. 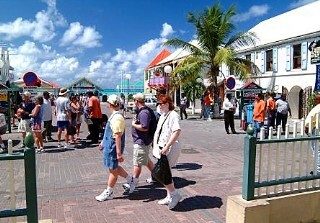 Onshore, cruisers often explore the shops or historic sites (including the old Courthouse shown at left*) of Philipsburg or the market at Marigot. Other visitor activities might include a visit to a Butterfly Farm, kayaking, horseback riding, dining at local seafood restaurants or mountain biking. Following is a look at a sampling of the island's options. Large cruise ships typically call at Philipsburg on the Dutch side, although smaller vessels may anchor off Marigot on the French side. A colorful cruise terminal at Philipsburg offers booking offices for shore options, gift shops and kiosks, restrooms and other visitor services. Editor's Note: You might read our brief piece done a few months ago about the Expansion of Cruise Facilities at Philipsburg. If you plan to take a cab ride, island tour or other transportation, you'll find these options available from the cruise terminal. Taxis are now regulated with set prices to specific locales. Alternatively, you might rent your own driving vehicle for an around-the-island tour. If you can handle fairly fast-paced touring and you have a full day ashore then consider a circular driving circuit from Philipsburg over the mountains to Simpson Bay, Marigot, Grand Case, the northeast beaches and back to Phillipsburg. The rewards of renting a vehicle are that you explore a lot more of the island. You’ll discover spectacular sea views, upscale residential areas, interior ponds, mountains and lush greenery. I’ve personally rented cars on three different occasions -- driving around the island. In each instance, I returned to the ship feeling the rental car money was well spent, given the spectacular scenery. 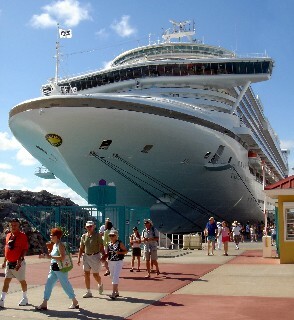 You can book a rental car onboard the ship or at the cruise pier. Once on the road, it’s pretty hard to get lost, considering you’re on an island. And if you do, you likely – as I did on my last trip – will end up at a lovely beach with a cute beachside café. Just remember, the speed of traffic around the island is slow to moderate, so think 35-45 miles an hour, not 50-70. Definitely give yourself plenty of time to return the vehicle and get back to the cruise pier. Traffic can occur, even in paradise! 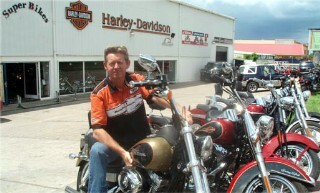 Contact Super Bikes St. Martin (www.h-dstmartin.com). Many cruisers, though, simply prefer to head for Philipsburg. You might take a water taxi from the cruise pier into downtown; cost is $3. Or, hoof it on a 20-minute walk into town. While it’s not hilly, though, be aware the walking surface can be uneven and often lacks sidewalks. However you get there, Philipsburg’s Front Street is a popular diversion. Founded in 1763 by John Philips, a Scottish captain in the Dutch navy, the port city today is bustling with tourists. Yes, it’s highly commercial, but it delivers Dutch and West Indies architecture and some historical sights. Make sure you peruse the buildings around Cyrus W. Wathey Square (see photo at right*). Here you’ll find the Town Hall and the 1793-era Courthouse. 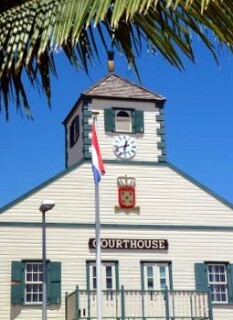 The stately courthouse is a large white wooden building that was originally Philips’ home. The small St. Maarten Museum (www.speetjens.com/museum) has artifacts and documentation reflecting the isle's past. Admission is $1. History aside, though, Philipsburg is a shoppers’ paradise. Duty-free shops sell souvenirs, sundries, hand-crafted goods, jewelry, art, electronics and gifts. And since shopping can be such hard work, take a break at the St. Maarten Guavaberry Emporium (www.guavaberry.com), 8-10 Front St.
Just look for the white and red gingerbread house. There you can sample the island’s tasty signature drink – a Guavaberry Colada -- for free. This liquor is made from a tart Guava fruit but the rum tames it nicely. 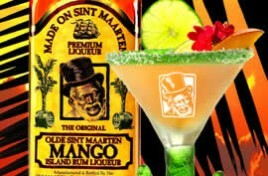 Another savory option is the Mango liquor (shown above*). Many tourists purchase a few small bottles of the various tropical libations as gifts for the folks back home. These also make great stocking stuffers for adults. Along Front Street are a number of restaurants and bars. If you plan to stop for a bite to eat, seek out one with an outdoor deck for relaxing beach and water views. Great Bay Beach (shown at right*) is also steps from the downtown area. Vendors offer rentals of lounge chairs, umbrellas and water sports equipment. You likely will view the 1631-era Fort Amsterdam from your cruise ship. 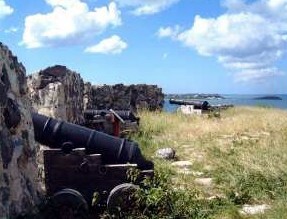 The fort was the first Dutch military bastion in the Caribbean, but fell into Spanish hands for some years. The Dutch got it back eventually. A few walls of the original fort remain. The views to Philipsburg are superb from this vantage point (see photo at left*). A second fort, the 1801-era Fort Willem, was built by the British. You’ll find it by looking for the huge television transmission tower just to the west of downtown Philipsburg. You might hike to the top of the fort, again for panoramic views of the town and bay. If you opt for an island tour, you’ll undoubtedly visit Marigot, on the French side. 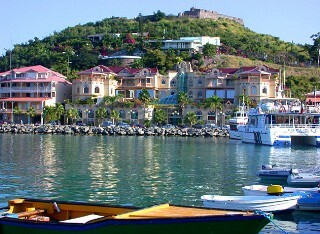 A steep climb up to the summit provides a panoramic view of Marigot and French St. Martin. 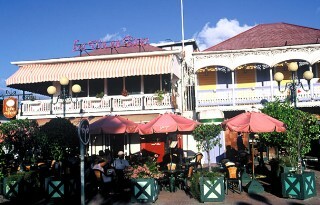 Marigot is a classic French city with art galleries, sidewalk cafes and designer boutiques. It’s also brimming with superb restaurants. If you’re seeking a freshly baked croissant, a baguette, a glass of champagne and gourmet dining, you’ll find it here. Many restaurants like La Vie En Rose (shown at left*) have outdoor cafes attached. Many of these are along the harbour area near the base of Fort St. Louis. If you’re visiting on either Wednesday or Saturday morning, head for the harbor’s open-air market. You’ll peruse a cornucopia of tropical fruits, spices and fresh fish as well as tables and booths for arts, crafts, Caribbean clothing and souvenirs. Further north, you’ll discover the charming fishing village of Grand Case, famed for its seafood and its gingerbread style architecture. The small wooden homes are painted in pastels and boast elaborate carvings. 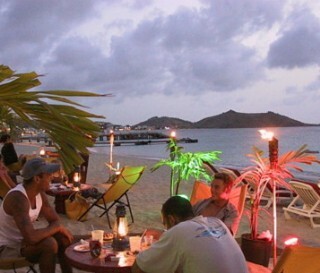 Some restaurants and bars have beachside tables (see photo at right*). 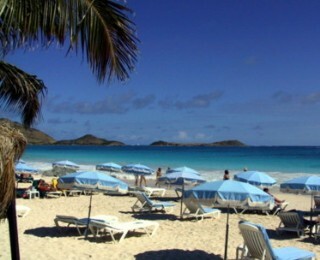 Everyone who goes to St. Maarten asks about the famed Orient Beach (see photo at left*) or Baie Orientale in French. It’s an easy taxi ride from Philipsburg. 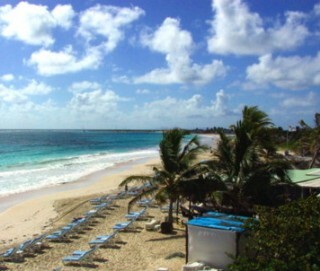 Orient Beach is quite huge in scope – with plenty of different beach areas to enjoy. Windsurfing is a popular option and you can rent various watersports equipment here. Or, you might just play beach bum and head for the many bars. A big draw (or curiosity) for naturists is the clothing optional section of Orient Beach. Dawn Beach is a good beach if you’re active and want to snorkel or go body surfing. Looking for seclusion? While you’ll find many secluded beaches throughout the island, Cupecoy Beach has caves and rock cliffs. 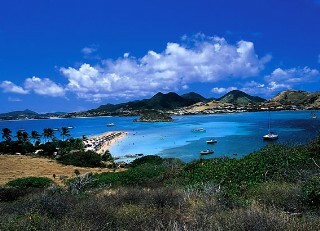 I personally like Baie Rouge, south of Marigot on the French side (see photo at right*). The last time I was there the water was a bit rough -- in terms of the swimming -- but the setting is spectacular. Beach chair and umbrella rentals are available. Most cruisers only have a couple of hours or a day to spend on the island. If you opt not to explore Philipsburg on foot, take an island tour or head for a beach, what else is there to do? Following are a few of the island's other diversions. 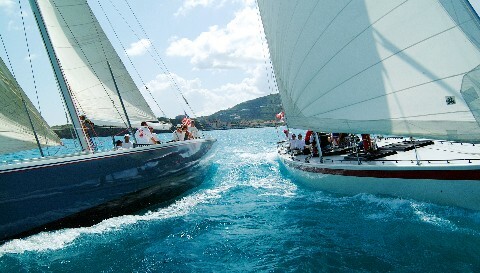 You might enjoy racing as though you’re part of the America’s Cup in the 12-Metre Challenge (www.12metre.com). This action-packed sea adventure pits first-time sailors and salty skippers alike in a race modeled exactly like the real America’s Cup. (Stars & Stripes and Canada II are shown racing above*). The vessels used were originally custom-made for the America's Cup and raced in that series' sailing events. Cruisers become part of the crew. 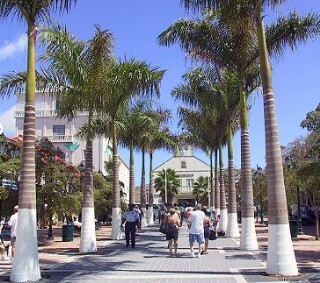 This shore trip ranks among the most popular in the Caribbean on many cruise lines. Or, you might set sail on a traditionally rigged, 72-foot-tall Lord Sheffield (see the photo at right*). It's actually armed with three black powder cannons much as you'd have found in the 1700s and 1800s on a true pirate ship. Once aboard, you'll set sail for Little Bay where guests can enjoy snorkeling among historic wrecks, view lost cannons from past battles in the island’s 350-year history and view marine life. Next, the ship will sail toward Simpson's Bay. 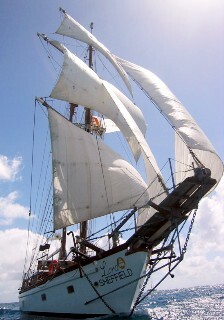 After a visit there, the ship will strike its sails and return to the cruise pier and Philipsburg. For more information, contact the Lord Sheffield Tall Ship Adventures at (www.Lordsheffield.com). One plus for outdoor lovers is the diversity of scenery on the island. 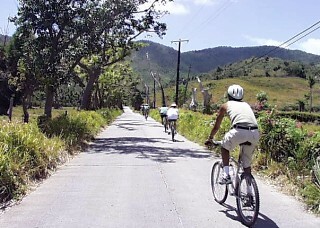 One popular activity is mountain biking -- starting at sea level and continuing upward to the top of the island’s tallest mountain and back. For mountain biking options, contact TriSports (www.trisportsxm.com). A unique “SNUBA and Snorkel” combo tour allows guests to explore the hidden depths of St. Maarten/St. Martin at three locales. The first is a sunken submarine that sits approximately 20 feet below the surface and offers guests the opportunity to discover a sunken piece of history. The second stop is “Shipwreck Cove.” Here, guests can explore numerous shipwrecks that detail three centuries of the island’s past. The third and final stop is the breathtaking coral reef where guests can swim with colorful fish. Contact Aqua Mania Watersports (www.stmaarten-activities.com). 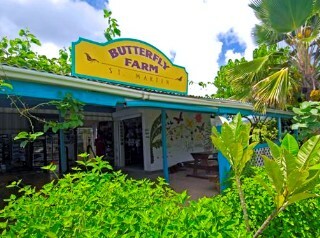 For milder pursuits, cruisers might take a side trip to the Butterfly Farm (www.thebutterflyfarm.com). Wander through the “Butterfly Sphere” complete with waterfalls, coy ponds and foliage. Guides will identify different species, point out courtship and mating displays and tell butterfly facts and stories. Guests will also witness the various stages of the butterfly's life cyle. *Photos used for editorial purposes above are owned, copyrighted and used courtesy of the St. Maarten Tourist Office or various tourism entities on the island. All rights reserved by these entities. Please do not link to nor copy these photos. Thank you.